Get consumers to have a positive interaction with AT&T Puerto Rico in order to shift sentiment from negative to positive after the island was struck by Hurricane María with feel-good content that showcases business solutions. And, reposition the brand as an entertainment company with a wide variety of services and benefits. The media strategy capitalized on the insight of the rising consumer trend of video streaming platforms like Netflix. 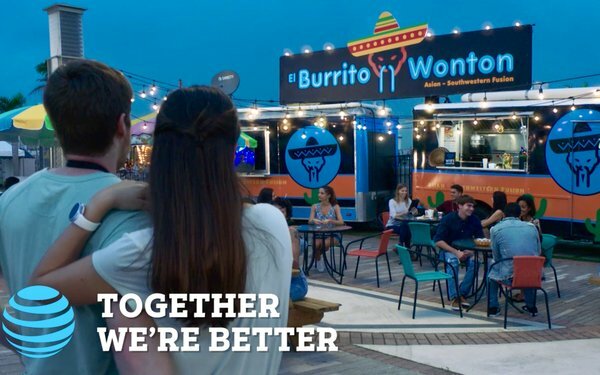 Through multichannel strategies, the brand was able to creatively reach consumers through their entire journey with storytelling on each of their touchpoints and by connecting with the Puerto Rican consumer’s love for food. The series told them story about two food truck owners operating across the street from each other, starting out as competitors and, over time, falling in love. Finally, they marry and merge their trucks. The communication strategy included TV spots, live integrations, print, digital advertising, social media, radio and, even, an interactive website. For the first time on the island, an advertising campaign was launched in a series format, with two giant outdoor mesh banners on the largest mall in Puerto Rico that were used to interact with each other. Engaged with audience through traditional and digital media. Shifted sentiment toward AT&T Puerto Rico from negative to positive. Increased sales by 20% over the same period a year ago. A sentimental love story engages an audience and can move emotion about a brand from negative to positive. Use every available medium to reach as large an audience as possible. This won the Content Marketing category in MediaPost’s 2018 Creative Media Awards.